One of the shortlist finalists for the 2014 Bailey’s Prize for Women’s Fiction, ‘Burial Rites’ is the story of Agnes. It’s 1829 in Iceland. In a cold, remote, and harsh landscape people eke out a living in damp farmhouses. Agnes arrives, unwanted, at one of these homes, the family forced to take in the criminal as she awaits her execution. A young priest is given the task of absolving her before the final day arrives and at first he is the only one she will talk to. She encounters hostility and is prejudged to be a violent witch capable of a heinous crime. But Agnes knows the truth. This is Agnes’ story. Her story moved me. Based on true events, Kent teases out the details of how this mysterious woman might have come to death row. She brings the reader on a remarkable journey of small reveals while building the suspense. She recreates 19th century Iceland so well, it almost functions as another character in the novel. Atmospheric and beautiful, I wanted to slow down and enjoy the writing, but I also wanted to keep the pages turning, gripped by what might be coming next. Stories of Agnes in Iceland have achieved myth status and yet not much is actually known. Kent researched her topic thoroughly and has given us a respectful and plausible fiction that is unforgettable. The author prefers to classify ‘Burial Rites’ not as historical fiction, but as speculative biography. A haunting, unique and powerful novel. Highly recommended for book clubs. Don’t listen to the following interview with the author until after you’ve read the book, because it does contain spoilers. But it’s a worthwhile 10 minute footnote to the reading when you are done. 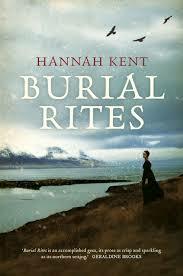 This entry was posted in Fiction, Four Star and tagged Burial Rites, Hannah Kent, Iceland. Bookmark the permalink.